Computer memory recycling at All Green Electronics Recycling uses the leading processes in the recycling industry to ensure that the recycled computer memory is used in the best way possible. Computer memory recycling at All Green Electronics Recycling uses the leading processes in the recycling industry to ensure that the recycled computer memory is used in the best way possible. Computer memory is an important electronic item that can, more often than not, be refurbished and re-used in other products. 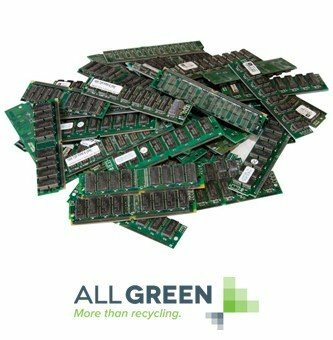 RAM, ROM and other computer memory is often worth a cash value to the previous owner, as at All Green Electronics Recycling we are able to repurpose or resell the memory. Allow All Green Electronics Recycling to be your computer memory recycling team. Unlike most electronic recycling centers with a one-size-fits-all solution, we work closely with your company. The ITAD strategy that we create with you both saves money and is better for the environment. We first attempt to repurpose your computer memory, which can be a revenue source for your company. If this is not possible, then we recycle the precious metals that are found in the computer memory. Because we are experts in this field, our strategy for recycling your equipment is the best choice – not only economically but also for the environment. We make it so that your company is able to recycle equipment responsibly in the easiest fashion possible. Our fleet of IT recycling trucks is the largest in North America. This means that you can arrange for our recycling experts to pick up all of your old IT equipment at your convenience. We take care of all of the packaging, labeling and removal of your computer memory. We also allow for you to utilize our technology to track your outdated equipment as it is being transported and goes through our system. We have earned the highest certificates in the business – R2 Responsible Recycling and ISO 14001 certification. We handle the disposal of data with the utmost care. This data, if lost, could be harmful to your firm. We have a long track record of handling our clients’ data in the most responsible fashion possible. We are certified in integrity and assurance, which is why our company is trusted by the largest businesses in the U.S. When your asset comes through our doors it is carefully managed through every step of the equipment recycling process. The fines for unsafe disposal of your equipment are significant and alone make for a good reason to recycle your equipment. We go far beyond the standard guidelines to ensure that your company is protected from risk, your old electronics are recycled and your company has a sustainable future along with our planet. Recycling is a business decision that makes sense any way you look at it. Computer memory recycling is one of the most underrated impacts one can make on the environment today. It is an impact that a significant portion of people in society is in a position to make, right now. For instance, 83% of individuals 18 to 34 years of age now report living in a home or shared space containing a computer, and that number is only expected to grow. Adding up the number of computers that this equates to quickly show shows big of a difference computer memory recycling is poised to make on our earth. Old, out of use memory or RAM chips contain toxic levels of lead that are poisonous to the planet if not carefully recycled. In addition, these RAM chips also contain precious metals which can be processed and refined for a modest return. According to a United Nations research group, worldwide efforts are needed to reduce the environmental damage caused by computer equipment. Just creating the computer alone requires ten times the weight of the product in chemicals and fossil fuels, many of which are toxic and help contribute to global warming. Each year, the world generates over 50 million tons of waste from electronics. According to the EPA, the United States accounts for nearly 10% of that waste. Both computers and cell phones tend to become outdated quicker than any other product on the market, with rehashes and new improved versions becoming available every single year, because of the exponential rate in which technology evolves. Unfortunately, this high turnover leaves us with a lot of poisonous and harmful materials lying around in landfills. Chemicals like brominated flame retardants and heavy metals like lead and cadmium often present extreme risk to factory workers and others that live near landfill sites where old computers are sent to rot. While there are very few restrictions or regulations as to safe disposal of used equipment by companies and end users alike, there is still hope in the consumers themselves taking a stance to make sure their materials are recycled properly. That means it is on everyone to seek out the fair and clean recycling of computer memory and take the fight for future generations into their own hands. It is a common thought to switch off the water while one isn’t using it, turning off lights when they aren’t in the room, and turning off the air conditioning when they leave the house, each for the sake of a better tomorrow. It is time to start looking at the pieces of hazardous material inside of each computer that is thrown away in the same regard. Consider recycling your used computer memory through All Green Electronics Recycling today.